We're delighted that you've chosen to renew your NNECOS Membership! To renew, make sure that you are logged in. and then click on "View Profile" in the top right corner of your screen. 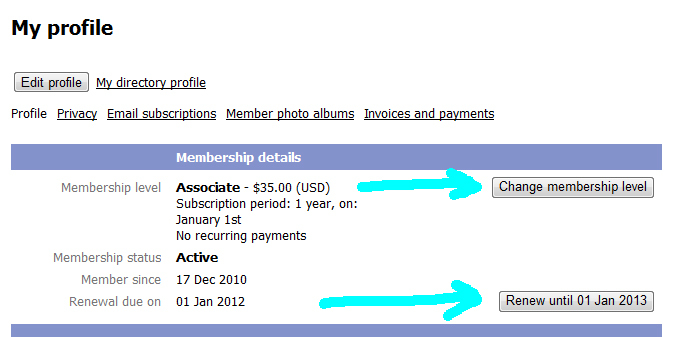 Once on that page, you will see a "Membership Details" section of your profile, under which there will be a button to renew your membership as well as a button to "change membership level" if you'd like to change to auto renewal or a two-year membership. Learn more about our Group Membership Discounts! For discount codes, email info@nnecos.org. If you have any difficulties logging in, please enter your email address in the box on the top right corner of the screen and click on "forgot password". You will be sent a new password that will enable you to login and access your membership account.